George Robertson is taking this meeting seriously. He focuses intently on other participants in the room, making eye contact, noting posture and visual cues, interjecting comments when appropriate. He studies diagrams scrawled onto a whiteboard, and, on occasion, uses a laser pointer to call attention to something he wants to address. Sound like just another productive business meeting? Well, you’re right—except for one little detail. The meeting is being held in Redmond, and Robertson is in Northeast Harbor, Maine, more than 3,000 miles away. How is this possible? That’s a question for the researchers behind the Embodied Social Proxies project, a joint effort between the Human Interactions in Programming (HIP) and Visualization and Interaction for Business and Entertainment (VIBE) groups within Microsoft Research Redmond. “For a team that’s mostly collocated, with one person somewhere else, that person is often out-of-sight, out-of-mind,” says Gina Venolia, a senior researcher in the HIP group. “They’re left out of the loop on ad hoc conversations. It’s hard to pull them in for planned meetings, because you put them on a speaker phone or on a projector and they get forgotten. They just aren’t as real as the person next door. Such a scenario became underscored for Venolia and colleagues in autumn 2008, when Robertson, a principal researcher in the VIBE group, suddenly found himself thousands of miles from his Microsoft Research colleagues. His wife had seen her work take her from the West Coast to the East Coast, and her husband used the opportunity to examine a research question. Gina Venolia meets with George Robertson. As it turns out, Venolia had been thinking along the same lines. While mulling the possibilities, Venolia recalled a scenario from her past. “Fifteen years ago or so,” she explains, “I was at [Silicon Valley-based] Silicon Graphics. I was in a group, and two of our senior people were located elsewhere. They worked out of their homes. Jim was in Columbus, Ohio, and Helga was in Reykjavik, Iceland. And these were important people. Reflecting on that lesson, it didn’t take long for Venolia to begin imagining a nascent research project. Add more information—live information. Add a screen and provide information about the remote worker’s activities. Analyze the person’s communications. Even—consider this—combine it all into a package that could be transported into a real-life meeting room. Welcome to the concept of Embodied Social Proxies—or, as the project inevitably came to be known, George-in-a-Box. In a nutshell, the researchers proceeded to connect a pair of computers to an array of cameras, enabling both hub and satellite presences to gain visibility into the other’s activities. And when the monitor is not actually being used by team members during a meeting, it displays information about the remote user’s calendar, activities, and availability. 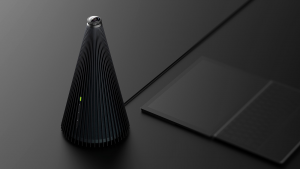 The team cobbled the necessary elements together, along the way borrowing a camera array from colleague Cha Zhang from the Communications and Collaboration Systems group at Microsoft Research Redmond. Put it all on a cart, roll it into a conference room, and there’s George, with a seat at the table and ready to engage. It was time, Robertson says, to figure things out. Then came a set of refinements. 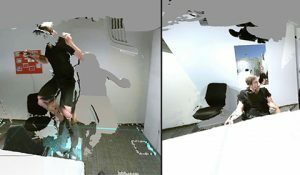 One problem was that while the hub-based team could view the remote member’s reactions, gaze direction, and attention, thanks to a Webcam on the satellite computer, the experience, from the remote perspective, was more problematic. So the project members outfitted George-in-a-Box with two more cameras. One, stationed above the monitor, is a pan-tilt-zoom camera operated via remote control, enabling the remote participant to focus on a whiteboard, an individual speaker, slides being projected during a meeting, or team members at a conference-room table. 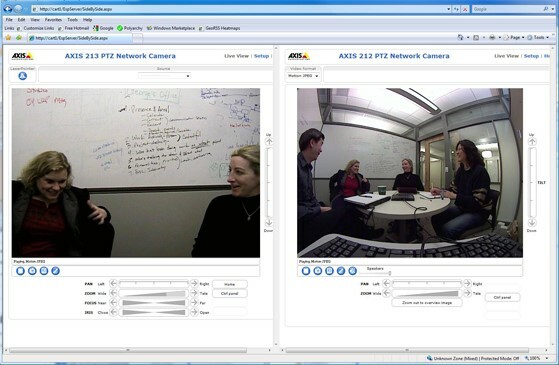 A third camera, affixed with a 140-degree, fish-eye lens, is stationed below the George-in-a-Box monitor, enabling the remote user to view practically everybody in the room, see their responses, watch who’s looking at whom, and gain environmental awareness at what is occurring in the meeting room. George Robertson gets a pair of views of the meeting he is attending from a remote location. At left is a customizable look that includes Kori Inkpen Quinn (left) and Gina Venolia. 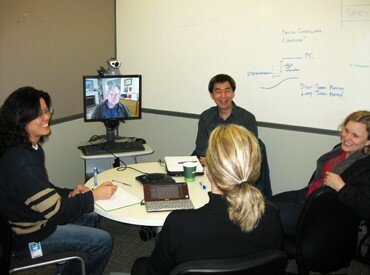 At right is a fish-eye view of everybody in the meeting, including (from left) John Tang, Quinn, Venolia, and Bongshin Lee. “This setup works really well in meetings,” Robertson says. “I’m able to, with all of these cameras, see how people are reacting to what’s being said. I can follow pretty much everything going on in the meeting, if it’s on the whiteboard or on the screen or interactions between people. Sometimes, I’m actually leading the meeting, and if somebody’s on one side of the table, and somebody else on the other side says something and I see that the first person doesn’t agree with it, I will ask what her response is. For Venolia, the cart presence just makes everything much more lifelike. Venolia, Robertson, and colleagues are not the first to head down this road. Other teams have placed a stuffed animal in a chair to represent an absent teammate. And, of course, we all have family mementoes to remind us of people who aren’t present. But make no mistake: The Embodied Social Proxies project is unique—in part because of its ingenious model. That’s a lot of disenfranchised satellites. In addition to the conversational benefits offered by the George-in-a-Box concept, there are also its awareness capabilities, although, Venolia and Robertson indicate, more work needs to be done on that front. A second kind of awareness built into the project regards activity awareness: What is George working on? Those questions and scenarios are what the information offered on George-in-the-Box’s awareness screen is designed to convey. His calendar is displayed, as is the time in his time zone, his busy/free status, and a description of his current activity. Also listed is critical information for long-distance colleagues: the quality of service between hub and satellite. “The intention,” Robertson says, “was to make it possible for somebody walking by the office to notice that I was available and have impromptu discussions. Still, says Venolia, the awareness work holds plenty of promise. In addition to improving the awareness display, the team is also working on a set of challenges. Networking reliability is crucial for this kind of work, as is dependable wireless access, insignificant network latency, and the ability to support more than one remote user. In recent moves, John Tang, a researcher based in Silicon Valley, also has joined the project as a satellite user. His cart sits alongside George’s in their own office in Microsoft Research’s Redmond headquarters. Work on multiple remote users is necessary for the project’s next step: a six-week summer trial with a handful of Microsoft product teams including remote workers to see how the technology changes communication patterns. “I’ve made a bet here,” Venolia says. “I’ve made a bet that having a hotline to George is a good thing. I don’t know how that bet is going to play out. Should it be a hotline, or should it be a telephone? If it’s a hotline, you could imagine adding semi-autonomous robotics so that George could just go to his next meeting. There are many tantalizing possibilities inherent in the technology. Meanwhile, Robertson, lacking robotics, must count on the kindness of colleagues to transport his cart from room to room. Among those happy to assist in helping George-in-a-Box traverse from office to meeting and back is Bongshin Lee, a VIBE researcher particularly interested in the awareness-display component of the project. Having a human colleague represented in such a manner has its lighthearted moments. One of George’s handlers has talked about leaving the cart behind and feeling as if she had left a baby in the back seat of a car. 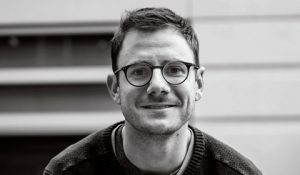 Team members—including Kori Inkpen Quinn, an expert on computer-supported cooperative work who has helped design the system and who is helping to evaluate it—meet regularly to discuss the Embodied Social Proxies project. Refinements continue. For George Robertson, he with a bi-coastal daily presence, albeit it sometimes “in a box,” it’s all about the bottom line. “When I’m in a meeting with the cart,” he says, “I feel much more engaged in the meeting, and I think people are more engaged with me. When they talk to me, they will turn and look at me in the cart, and I can tell that they’re doing that.